Anniversaries are a time for friends and families to celebrate with the loving couple. Throwing an anniversary party requires a lot of planning and time. When you are assigned the task of throwing a party for a couple to celebrate their love and companionship, you need to plan the event at least three to four months ahead. Here are a few useful tips to follow when planning an anniversary. Before you can plan the anniversary party, you have to know the date of the anniversary. This allows you to plan all the other details for the event. 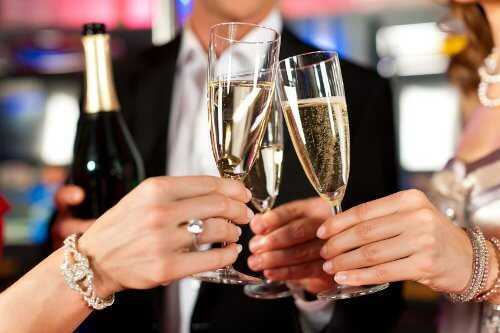 The type of party that you throw will determine how much money you will need to budget for the event. The formality of the party also determines the attire for the guests. Locations such as a restaurant, banquet hall or hotel are places that you may consider. When you select a location, always call to make reservations in advance to ensure that it will be available. Ask the destination if there is parking available, bathroom facilities and kitchen accessibility if you plan on catering the event. Include the date, time, location, theme and formality of the party. If you plan on throwing a formal anniversary party, have the invitations printed on elegant cardstock. Invite the friends of the couple and all their family members. Contact a catering company or prepare the menu yourself. If you are on a budget, inform guests to bring a covered dish to the party. Include a buffet if you need to serve a lot of guests. Always include beverages that accommodate to everyone such as alcohol, caffeine-free beverages and water. Pick one or two colors for the event if you do not have a theme in mind. Formal events typically stick with bold colors such as black, red or white. Include decorations such as flowers, balloons, candles, tablecloths and photographs of the couple. Incorporate the couple’s favorite items and hobbies into the decorations to make the party personal. Hire a band, musician or a disc jockey. The entertainment at the party will ensure that guests have fun. Play board games, have a limbo contest or set up musical chairs so that the atmosphere remains entertaining. This is especially important for milestone anniversaries. If you cannot hire a photographer, designate someone to take plenty of pictures. Capture all the memories of the party so that the couple can enjoy them for years to come. Do you have any other tips for planning an anniversary? Please share them in the comments!